To generate leads and promote your products, you have many tools at your disposal such as SEO, social networks, emailing, paid advertisements and advertising banners. Placing advertising banners on specialist websites should be part of your lead-generation strategy in order to raise your profile and reach an audience that does not necessarily know you yet. You must assert your presence on the Internet. Why integrate advertising banners in your strategy for generating leads? When you put in place a lead generation strategy, you need to think of it as a whole and therefore put in place various, complementary actions that will enable you to achieve the goals you set. Banners should not be an exception to the rule and should therefore be integrated in your communication plan in the same manner as other tools. Advertising banners will raise the visibility of your brand and enable you to customize your messages according to the websites that you select. Online advertising campaigns are generally quick and easy to put in place, unlike the launch of an email campaign, which takes more time. Be careful to find the right balance between the banner’s visibility and how intrusive it is for visitors to the website. The aim is not to get a bad reputation but to raise your profile and to promote your services. The choice of website and the size of the banner are therefore paramount. One more point: Monitor feedback on your banner campaigns. The site that publishes your banner will be able to provide you with statistics about the display, the number of clicks, the click rate, etc. Before choosing the size of the banners, you first need to select the specialist site(s) you want to be seen on. All websites that publish advertising banners do not provide the same offer in terms of formats. As when implementing your lead generation strategy, you must first therefore consider the different opportunities available to you. Defining your target character profiles and the behavior of your prospects will therefore be very useful to help you select the sites best suited to displaying your advertising. You need to be visible on the websites used by your prospects, and therefore understand their habits. Once you have selected one or more websites, it is useful to get more information about the website users, the number of monthly visits, the click rates on the different formats of banners proposed and, if possible, aim at a specific target group, i.e. not all visitors to the website but a part of the latter, based on criteria collected by the website publisher. Finally, it is also important to find out about the pricing policies of the different sites, so you can measure the return on investment of your campaigns. Is the cost based on CPT (cost per thousand prints) or CPC (Cost Per Click), for example? Choosing the best website to publish your banner is the first criterion you need to focus on. Once the website has been selected, you have a panel of formats available. Each site does not offer the same choice of formats for banners. You must therefore choose the site and format before you start creating your advertising messages. There are different formats of banners. TheIAB (Interactive Advertising Bureau) has put in place standardized advertising formats in order to make online advertising more effective. Each format has its advantages and disadvantages; you must select the format best suited to the message that you want to publish. For example, a square format is better for a picture, whereas a horizontal banner will be better for a text-based message. 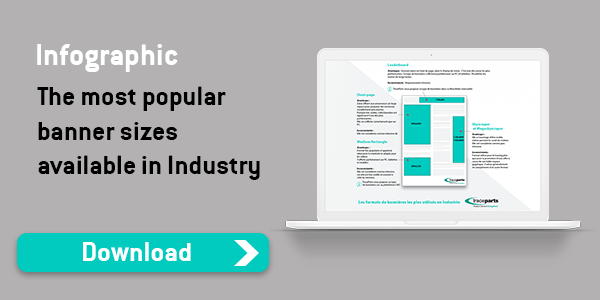 To help you make your choice, please do not hesitate to download the information sheet on the most common banner formats used. BEWARE: a website whose pages are littered with banners is not necessarily a wise choice. The more banners there are, the more competition you have and the less your message will be noticed. Choose websites that are not too cluttered, where your banner will be highlighted. At TraceParts, we offer a space for 3 banners on the right of the screen on our CAD platform. These rotate and change approximately every 20 seconds to ensure optimum visibility for all our advertisers. Don’t hesitate to contact us if you have any questions on this subject.